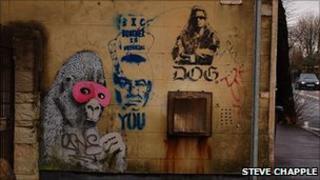 One of street artist Banksy's most famous early works in Bristol has been mistakenly painted over. The gorilla in a pink mask on the wall of the ex-North Bristol Social Club, in Eastville, had been a familiar landmark in the area for more than 10 years. But the building has recently been turned into a Muslim cultural centre. New owner Saeed Ahmed assumed it was a regular piece of graffiti and had it painted over. "I thought it was worthless," he said. He added: "I didn't know it was valuable and that's why I painted over it. I really am sorry if people are upset." Local resident Dean Meadows posted a photo of the repainted wall on his blog. He described the whitewashing of the painting as a "big, big shame". "It's currently being shared around the world on Twitter, so hopefully Banksy will hear and replace it himself," he said. Mr Ahmed said he was willing to explore options to see if the whitewash can be removed and the painting restored.